Short Story is published twice a year, in the Spring and Fall. 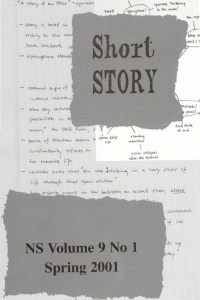 Original short stories, reviews of short stories, interviews with authors and essays on short story theory are all addressed in the journal's biannual issues. Read below for the Table of Contents from the most recent Short Story, and click on the article names for brief excerpts. More issues are available for browsing in the Previous Issues section (click the button in the left column), and if you would like to subscribe to Short Story, click on the Subscriptions button to the right. Thanks for your interest. Probing the intersection of fiction and faction, [Dunbar-Nelson's] stories constitute a powerful critique not only of the Americanization of New Orleans, but also of the forces of history that were transforming her world as a new century was dawning - a century that would become the American century. Many of her characters live in a world that has no place for them simply because their existence alone threatens newly created social, cultural, and economic hierarchies and categories; they do not fit on either side of the new lines of division the American century begins to draw. "Read this for me," he said. "Then tell me if it's worth my time." It was a paperback copy of a new novel (Count Gizmo, by Norman France, the first effort of a hopefully pseudonymous, ostensible wunderkind who, according to the back cover blurb, "has always lived with his parents somewhere near Prospect Park") given to him by his equally new girlfriend, a senior in his Seminar on Teaching whom Woody Allen might have had in mind when he coined the term "kamikaze woman," referring in her case to a highly-sexed, neurotic-to-the-point-of-borderline personality-disorder who had already become way too attached to him. It wasn't that kind of self-abasing worship that makes feminists furious; it was a mutually satisfying indulgence in a deliciously dangerous self-destructive romp. The first time my wife tries to kill me, we're driving toward the city, to the movie theaters there. She sparks a joint. She's a nurse and they test her for drugs all the time at work. But she's got her ways around trouble: chlorine, salt, replacement urine for the unannounced tests, homemade douches and body flushing teas for the ones they tell her about in advance. So she smokes. We're passing barns, pig farms, giant lots of soy beans. Nothing we haven't seen before. We're headed toward a city, to the movie theaters there. She's driving, talking to me as she smokes-- talk, drag, hold, hold, breathe, talk some more. Going on about her work, and I've heard all that too. Coding. Going septic. Irrigating. The sort of terms a skier might use. A week before, she got a haircut from Jimmy, her hair guy-- just a little, less than an inch, although she'd gone in for more. When she got home, she called herself a coward. My concern here is to bring about a possible visualization of the dynamic configuration of the short story as we have been accustomed to regard it from Poe and Brander Matthews to the present: that is, not as a story merely short, but rather as a form based on a kind of topology as construed in mathematics and physics. I also propose to contrast the resulting model with the more dynamic configuration of a novel. I will particularly show how the topology of the attractor in science posits connections with the short story as an art form that go beyond traditional metaphor. James Alan McPherson's "The Story of a Scar" opens in a doctor's waiting room. The narrator of the story is a young man who, to ostensibly pass the time, asks a fellow patient to tell him the story of the scar she received on her face. As he listens to her story, he claims that he is struck by "the burden of insight" (127). That intriguing phrase yokes together two words with antipodal connotations. The positive resonances associated with the word insight are undercut by the negative feeling tones of the word burden. The concept of insight is essentially about transitioning from a state of relative ignorance to a state of more complete knowledge. It is about illumination, about the end of innocence and naievete. Illumination then can only be construed as a burden when it brings to its bearers a notion of accountability for their actions. The curious thing about "The Story of a Scar" and the short story collection Elbow Room (1977) in which it appears is that more often than not the protagonists in the stories do not labor under the burden of insight. With her very first collection of stories, titled Interpreter of Maladies, Jhumpa Lahiri garnered a string of prestigious literary awards in 2000, including the PEN/Hemingway Award and the Pulitzer Prize. Not bad for a book that had been turned down by a literary agent. And certanily no small feat for a writer who is still in her early thirties. Born in England of Indian parents and raised in America, Lahiri, now a resident of New York City, captures the idiosyncrasies of all these cultures in her fiction with penetrating observation and uncanny precision of detail. Eight of the nine stories collected here had appeared in various literary and nonliterary journals around the nation before they found a home in the present book. They reflect, in most cases, the experiences of immigrants; but deliver messages that transcend the narrow bounds of immigrant experience to embrace universal human issues.